AJZ იწვევს ხელოვანებს საქართველოდან პროექტ CAMERA FUTURA: storage for (im)possible realities-ს ფარგლებში თანამშრომლობისათვის. AJZ invites artists from Georgia to collaborate within the project - CAMERA FUTURA: storage for (im)possible realities. მომავალი, რომელსაც ვერასდროს წარმოიდგენდით. რომელზეც ვერასდროს იფიქრებდით. წარმოსახვა არასდროს ყოფილა უფრო ადვილი. მშვიდობით, მოწესრიგებავ. გამარჯობა, ცნობისმოყვარეობავ. გამოიკვლიე სამყარო ისეთი, როგორიც ის არასდროს შეიძლებოდა ყოფილიყო. თქვენ შესაძლებლობა გეძლევათ გახდეთ camera futura -ს, შე(სა/უ)ძლებელი რეალობების საცავის თანაავტორი და არქიტექტორი. არ არსებობს წესები. ნებისმიერი ნამუშევარი, რომელიც შეიძლება იყოს წარმოდგენილი ნათელი მომავლის მოზაიკის ნაწილი. ფორმატი/ხანგრძლივობა/მასალა/მედია, ასევე განსაზღვრული არ არის. შემოსული ნამუშევრები ან მათი იდეები განხილული იქნება camera futura-სთან კავშირში და განთავსდება ინტერნეტ სივრცეში, რათა განხილული იქნას როგორც გამოფენის ნაწილი. გამოფენა(ები) შესაძლოა ინიცირებული და განხორციელებული იქნას ნებისმიერ ადგილას ნებისმიერი ადამიანის მიერ, ვისაც ხიბლავს camera futura-ს იდეა და საცავის შინაარსი. ნამუშევრები ყოველი გამოფენისთვის საცავიდან უნდა იქნას არჩეული. არსებობს დამოკიდებულება, რომ არსებობს განსხვავებული სიცოცხლის შესაძლებლობა. არსებობს დამოკიდებულება, რომ არსებობს განსხვავებული სიცოცხლით ცხოვრების ნამდვილი შესაძლებლობა. არსებობს დამოკიდებულება, რომ ჩვენ მუდმივად გვავიწყდება განსხვავებული სიცოცხლით ცხოვრების შესაძლებლობა. არსებობს დამოკიდებულება, რომ ჩვენ მუდმივად გვავიწყდება განსხვავებული სიცოცხლის წარმოდგენის შესაძლებლობაც. არსებობს დამოკიდებულება, რომ ჩვენ მუდმივად ვკარგავთ განსხვავებული სიცოცხლის წარმოდგენის უნარსაც კი. camera futura იმ ინიციატივის საწყისი სათაურია, რომელიც ეფუძნება ზემოთთქმულს და მიზნად ისახავს განსხვავებული სიცოცხლის წარმოდგენის უნარის განახლებას. attention, the future is here! the future you’d never imagine. the one you could never think of. imagining has never been easier. so long arrangement. hello curiosity. explore the world as it could have never been otherwise. you are encouraged to become a co-author and architect of camera futura, a storage for (im)possible realities. there are no rules. any work that can be a piece of mosaic of the brightest future you can imagine. submitted works or even their mere concepts will be examined in terms of their relevance to the implicit idea of camera futura. submitted works will be put online for considering them as part of a show. the show(s) can be realised and initiated everywhere and by everyone attracted by the idea of camera futura and the content of the storage. the works included in each show should be selected from the storage. There is concern that there is a possibility of a different life. There is concern that there is a real possibility of living a different life. There is concern that we constantly miss the possibility to live a different life. There is concern that we constantly miss the possibility even to imagine a different life. There is concern that we constantly lose even the capacity to imagine a different life. camera futura is a provisional title for an initiative that grounds on these concerns and aims at reviving this very capacity to imagine a different life. 2009 წლის ოქტომბერში AJZ დაარსდა, როგორც ხელოვანების მიერ ორგანიზებული არაკომერციული სივრცე, ნვარდ იერკანიანისა და ჰარუტუნ ალპეტიანის მიერ. AJZ-ში განხორციელებული ღონისძიებები მრავალფეროვანია და მოიცავს - გამოფენებს, პრეზენტაციებს, შეხვედრებს ხელოვანებთან, ჩვენებებს და საგანმანათლებლო პროგრამებს, როგორებიცაა ვორკშოპები და ლექციები. ხშირ შემთხვევებში ეს ხორციელდება სომხეთის ადგილობრივ სახელოვნებო ინსტიტუტებთან ერთად თანამშრომლობით, როგორებიცაა: AICA Armenia, Utopiana.am, AFG film club, Art & Cultural Studies Laboratory, Suburb Cultural Center and others. AJZ-ს ხელშეწყობა ხდება დამფუძნებელთა მიერ და მეგობართა დახმარებებით. დასაწყისში, ინიციატივის მთავარ იდეას წარმოადგენდა ერევანში ალტერნატიული საგამოფენო სივრცის შექმნა, რომელიც ღია იქნებოდა ხელოვანთათვის და კურატორებისთვის, როგორც ადგილობრივ, ასევე, საერთაშორისო დონეზე. თუმცა, მოგვიანებით გამოჩნდა, რომ საგამოფენო სივრცის ნაკლებობა იმდენად შესამჩნევი პრობლემა არ იყო, რამდენადაც არსებობდა სახელოვნებო წარმოების მგომარეობის შეცვლის საჭიროება. ეს არ ნიშნავდა, რომ AJZ-ემ შეცვალა მისი კურსი, არამედ, ძირითადი საქმიანობის ტრანსფორმაცია მოხდა დროის განმავლობაში. მიუხედავად არსებობის ხანმოკლე ისტორიისა, AJZ-მ შეძლო ჩამოეყალიბებინა კურატორული კოლექტივი, რომელიც მოქმედებს სხვადასხვა ინიციატივებით. ბოლოს განხროციელებული პროექტი, „იმედის ეკონომიკა“ (Economy of Hope) განხორციელდა გიუმრის მერვე ბიენალეს ფარგლებში. 9 ხელოვანს მიეცა საშუალება გამოეკვლია იმედის ფენომენი, არა მხოლოდ როგორც გონების ემოციური ნაწილი, ასევე, როგორც ერთგვარი სასაქონლო პროდუქტი, რომელიც ჩნდება სურვილსა და მის შესაძლებლობა-შეუძლებლობას შორის. ეს იყო იმ სისტემათა დაშლის მცდელობა, რომელიც გარკვეულ სოციო-ეკონომიკურ მდგომარეობაში ასრულებს იმედის შექმნას, გაყიდვასა და მოხმარებას, რაც შეიძლება განიცადო, მაგალითად, სომხეთში ცხოვრებისას. ნვარდ იერკანიანი არის ერევანში, კულტურის სფეროში მომუშავე პროფესიონალი. მან შეისწავლა არქიტექტურა და მშენებლობა ერევნის სახელმწიფო უნივერსიტეტში და ასევე, გაიარა ერთწლიანი კურსი „გამოფენისა და კულტურული კრიტიკის საქმიანობა“ ხელოვნების კრიტიკისა და კურატორული ტრენინგის სკოლაში, რომელსაც ახორციელებდა AICA-Armenia. ის არის AJZ space-ის თანადამაარსებელი. 2005 წლიდან ნვარდი იყო სხვადასხვა სამოქალაქო მოძრაობების აქტიური წევრი და თანა-ინიციატორი. ეს მოძრაობები ძირითადად შეეხებოდა საჯარო სივრცის, ურბანული ტრანსფორმაციის, გენტრიფიკაციისა და ზოგადად სამოქალაქო საზოგადოების საკითხებს. 2012 წლიდან ნვარდი ICA-ს (ერევნის თანამედროვე ხელოვნების ინსტიტუტის) პროგრამების მენეჯერია. ჰარუტუნ ალპეტიანი არის არის ერევანში, კულტურის სფეროში მომუშავე პროფესიონალი და ჩართულია როგორც კურატორულ, ასევე, სახელოვნებო პრაქტიკაში. ის არის AJZ space-ს თანადამაარსებელი და სოციალური აქტივისტი. მას აინტერესებს პერფორმანსული ხელოვნების თანამედროვე ტენდენციები. ჰარუტუნი ერევნის თანამედროვე ხელოვნების ინსტიტუტში პროექტების ლაბორატორიის კოორდინატორია. მისი ერთ-ერთი ბოლო დროის პროექტია - „იმედის ეკონომიკა“, რომელიც, 2012 წელს გიუმრის მერვე თანამედროვე ხელოვნების ბიენალეს ფარგლებში განხორციელდა. ის ამჟამად მუშაობს პროექტზე: Camera Futura: storage for (im)possible realities. AJZ was founded in October 2009as a non-commercial artist-run space by Nvard Yerkanyan and Harutyun Alpetyan. Events taking place in AJZ are various in formats – from exhibitions, presentations, artist talks, and screenings to educational programs like workshops and lectures. In many cases it was done in collaboration with local art institutions like AICA Armenia, Utopiana.am, AFG film club, Art & Cultural Studies Laboratory, Suburb Cultural Center and others. AJZ is supported by its founders and by donations received from friends. Originally one of the basic intentions of this initiative was the possibility for an alternative exhibition space in Yerevan, which would be available for artists and curators of local and international scene. But soon it has become apparent that there is no such a notable deficiency in representational spaces but rather a need for certain changes in conditions for artistic production. Yet this did not mean that AJZ changed its course though some intrinsic transformations could happen in time. During its short existence AJZ could form a curatorial collective of sort, which appears time after time with different initiatives. 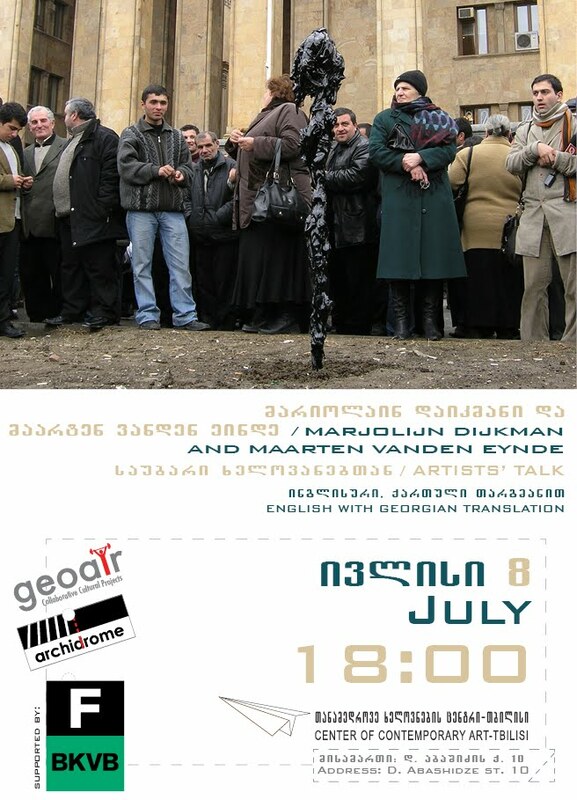 The last project Economy of Hope was implemented in the frames of 8-th Gyumri Biennale. Nine artists were proposed to explore the phenomenon of hope not only as it appears in our mind emotionally, but also a commodity of sorts, a product of the gap between desire and its (im)possibility. It was an attempt to deconstruct those systems that complete the production, sale and consumption of hopes in certain socio-economic condition, such as one can experience living in Armenia. Nvard Yerkanian is a cultural worker based in Yerevan. Graduated from Yerevan State University of Architecture and Construction as well as from year-long course Art Criticism and Curatorial Training School "Job of Exhibition and Cultural Criticism" conducted by AICA-Armenia. Co-founder of AJZ space - an open art space for artistic and curatorial projects. Since 2005 Nvard was an active member and co-initiator of different civil movements, mainly touching the issues of public spaces, urban transformations, gentrification and civil society in general. From 2012 Nvard is the program manager at ICA (Institute Contemporary Art - Yerevan). Harutyun Alpetyan is a freelance cultural worker based in Yerevan, engaged in both curatorial and artistic practices. Co-founder of AJZ space (an informal non-commercial art space in Yerevan, founded in 2009). Social activist. Largely interested in current trends in performing arts. Working at the Institute of Contemporary art in Yerevan as project lab coordinator. One of the recent projects, namely Economy of Hope was accomplished in the frames of 8-th Gyumri Biennial of Contemporary Art in 2012. Currently working on a project Camera Futura: storage for (im)possible realities.